Discussion in 'Gear & Apparel' started by Jim C-G, Mar 14, 2018. I know some of you certainly do a lot more camping than I do, but here's a video of what I am am camping with. With the amount of camera gear I have now... I really need a trailer lol. Bob and fortech like this. Thanks Gregg. I'm hoping to at least one night camping before the July 1st weekend lol... guess I'll pack longjohns. Now I want to do a video showing the slightly different setup I run with that will look very similar to this setup with the same panniers, duffel and top box but different tank bag. The blue bag is water which I don’t always need to carry but it easy to pack. I also have a 1 gallon gas bladder for the stretch between Dawson and Eagle Plains. The net is only for quickie add ones like Beer close to a destination. 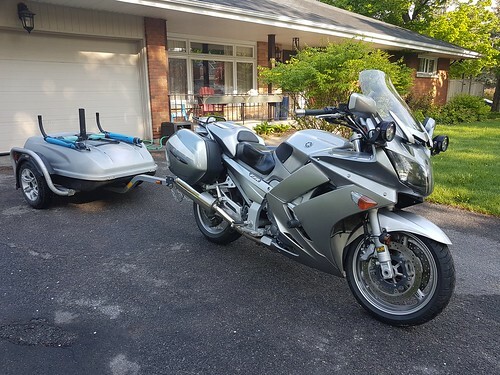 I just got a trailer - it came with my new-to-me 2011 FJR. No idea whether I will use it much for camping trips or not. It would be great for lugging all kinds of stuff to a campsite where you park it and do day rides (if the object of the trip is mostly riding rather than camping). Great beer hauler and for fetching groceries for a group as well. Not so great if you are staying one night each in multiple places and hauling the trailer everywhere. Absolutely not a problem hauling with the FJR (I did 5500 km bringing it home from BC) but it does diminish the riding experience as well as hitting you at the gas pump. Extra cost for the Newfoundland ferry too. RTWPaul is on his 3rd trip around the world by bike, I guarantee he knows what works. He and Eglė spent a week at my house last summer, really good people. If you’re looking to buy use his links, he gets a tiny kickback. I could be gone for a year with my bike as currently loaded (if I could afford it). And lest you think I am traveling light, my kit includes a cot, a pillow, and a camp chair, as well as the tent, sleeping bag, and ground cover. Although I am not carrying cooking gear or utensils, you can see from the waterproof tote that there is room for them if I wanted. After decades of hauling too much stuff around North America, I now only carry what I need. Those little plastic cards are my ace in the hole if I ever find myself absolutely needing something, but it rarely happens. Backdraft and HunterSon like this. 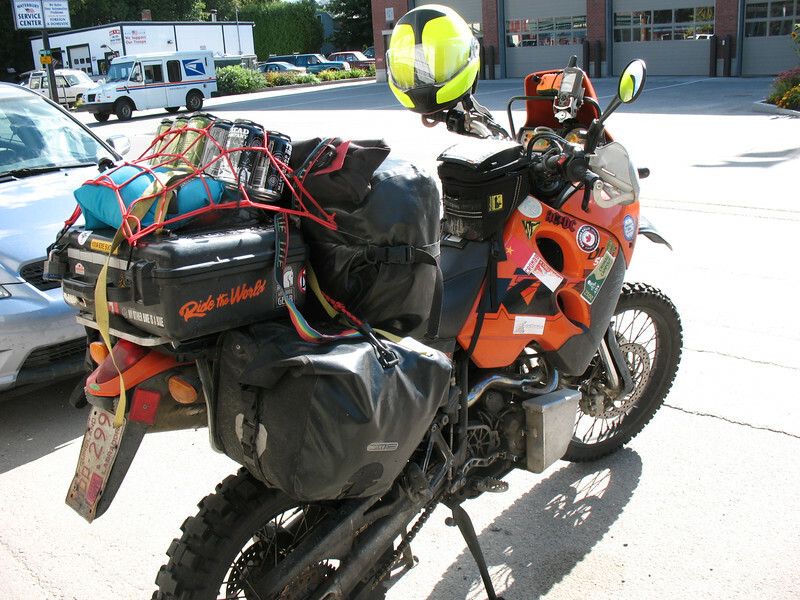 I’ll see about some pics and maybe some video descriptions when I do my final repack and load the bike in Whitehorse. I still carry far too much... and part of it is the "essential" electronics - small laptop, external drive(s), cameras, chargers, cables... tripod. Now... the drone. Maybe I can cut down the load by ditching the 4th pair of underwear, socks and T-shirt? I’m only going with an iPad, 2 GoPro’s, a waterproof point & shoot. Might bring a 2nd point and shoot but may just leave it as the iPhone takes good pics too. Ah, camping gear.... I've backpacked, winter camped, camped from kayak, canoe, long liner, float plane, motorcycle trailer and car/truck/vans at different times. I think the most challenging camping conditions so far were when we camped on the TLH, Gaspe Peninsula, and when riding in Alaska. Because: mud, flies, loose gravel, rain, calcium chloride, vibrations, cold, wind dust and the odd psycho cager. Here's a pic of our riding buddy and Mrs. Bob on TOW Hwy in 2016, near the turnoff to Eagle. He had a Redverse tent (which was later stolen on him in Calgary) that was excellent for cooking, storing riding gear, sleeping and drinking in. Mrs, Bob and I had a Eureka 3 man tent, Helinox chairs, MEC inflatable pads and light sleeping bags with just enough utensils to make coffee or tea. Bring your groundsheet and a chamois to wipe everything off if you have to pack up wet. Mrs. Bob says she won't be going North with us next summer so we can do more 'exploring'. I'll have soft bags and spare gas for more off pavement riding on that trip. We got away with hard bags riding two up, but I won't chance hard bags riding solo. FYI, the dirt roads shook the Montana 650 to the point of being non functional, shook the P&S Canon Elph into submission when it was hard mounted, and the GoPro is still recovering. The USB unit which plugged into the cigarette lighter and which I powered the GoPro and P&S off did mostly ok most of the time... except when it didn't. I wouldn't have gotten any dirt road video if Mrs. Bob hadn't operated the GoPro with one hand and the P&S with the other. The "tweenie" temps we encountered most of the time killed batteries fast so video cameras had to be hard wired to last. Take a Radio Shack or similar charger for your cell as well. Next time everything will be soft mounted... GPS will be velcro-ed onto the tank bag (GPS not needed much up North but nice to save the day's tracks for future reference); GoPro will be helmet mounted on the XD4 with a six foot USB cord going to ciggy lighter; I'll "float" the cigarette lighter plugin with some rubber bands so hopefully that will work better; and I'll just hang the P&S around my neck on a chord for when I need it. Everything will have dedicated ziplock bags to keep dust and mud off. A small amount of electrical grease can come in handy. Also, forget anything with EXPOSED zippers that get coated with serious amounts of calcium chloride, especially zippered boots and pant zips. I used cheap hi vis PVC rain gear with snaps & velcro to protect my good riding gear from the calcium chloride when it rained and dust when it didn't...plus it keep you warmer. Also mud caked onto riding gear seems to transmit water thru the Goretex pretty quick. Goretex lined boots with buckles or laces work well. Fleece tops over merino wool undies baffle the 'skeeters and fly netting is also a must when camping. I've been using rubber gauntlet gloves from Mercer Marine for wet riding. Same gloves used for mussel picking. They have a fuzzy warm interior and cover your sleeves enough to keep rain from blowing up your arms. We had balaclavas and toques and used both for flies and cold/wet. Keep a small squeegee on your left thumb in case your visor takes a hit of muddy water in close traffic. Most ski shops have them. Also clear safety glasses if you anticipate freezing rain/sleet... you'll need to flip your visor up when it ices up occasionally and the sleet will blind you without some eye protection. We had the usual tools, spare tire, tire repair kits, electric pump, small booster cables, and a couple of square feet of HD foam to kneel/work/lie on when doing stuff on the dirt. I read somewhere on here that 'baby wipes' are good for cleaning dead flies off bikes and helmets. I'll try that later as the biggest annoyance up North, even on paved roads, was the wasps and hornets attracted to the blood and guts on the bike and helmets as soon as you stopped. I was told ANY chemical can void the warranty of certain helmets so keep that in mind... I've found cold water works really well to shrink bug guts and clean visors if you have a source. Great info from the voice of experience. I’ll be adding a couple of things to my setup for when I leave in a week and a half. So you’re saying a coating of mud or calcium chloride on Gore Tex riding gear will cause it to leak? I’d rather not add the rubber suit to my pile. Dust and dirt will absorb the water and allow it to soak through. That’s why they recommend washing with mild detergent to ‘recharge’ the water proofing. I'll be following whatever you post on your ride for sure. Also looking forward to Jim C-G's drone movies.